#1. This week's number one is an experienced international point guard Michael Umeh (188-84, college: UNLV, currently plays in Poland). He led Twarde Pierniki to a victory over one of league's weakest teams Miasto Szkla (5-18) 99-91 in the Polish EBL in Friday night's game. Umeh was MVP of the game. He recorded 21 points, 5 rebounds and 4 assists. Polski Cukier Torun (20-4) is placed second in the EBL. It was his team's fifth consecutive victory in a row. It's Umeh's first season with the team. Umeh has relatively good stats this year: 13.7ppg, 2.6rpg, 2.8apg, 2FGP: 59.2%(42-71), 3FGP: 42.5% and FT: 84.4%. He has a dual citizenship: Nigerian and American. Umeh is currently a member of the Nigerian senior national team. #2. Second place goes to former international forward Melvin Ejim (201-91, college: Iowa St., currently plays in VTB United League). He contributed to an Unics Kazan's victory against the closely-ranked Lokomotiv (13-6) 84-77 in the VTB United League last Saturday. Ejim had a double-double by scoring 15 points and getting 10 rebounds. He also added 3 assists in 24 minutes. It was the game of the round between two top 4 ranked teams. Unics Kazan (15-4) is placed second in the VTB United League. This year Ejim averages: 7.9ppg, 6.5rpg, 2FGP: 52.3%, 3FGP: 25.9% in 11 games he played so far. He is another player who holds two passports: Canadian and Nigerian. Ejim played for the Nigerian national team in 2012. #3. The Nigerian player who performed third best last week abroad was an international center Tonye Jekiri (213-94, college: Miami, FL, currently plays in Turkey). He contributed to Gaziantep's victory against the closely-ranked Besiktas (11-9) 69-63 in the Turkish BSL on Sunday night. Jekiri recorded a double-double by scoring 13 points and getting 14 rebounds. He also added 4 assists. Gaziantep Basketbol (13-7) is placed fourth in the BSL. It was his team's fifth consecutive victory in a row. This season Jekiri has relatively solid stats: 12.5ppg, 10.7rpg, 2.0apg, 1.2spg, 2FGP: 59.0%(105-178) and FT: 62.9%. He is also a member of the Nigerian senior national team. #4. Center Jeleel Akindele (216-83, agency: BeoBasket, college: Chicago St., currently plays in Mexico) could not help Fuerza Regia (31-9) in their last game. Despite Akindele's very good performance the first-placed Fuerza Regia (31-9) was edged 84-81 at home by the lower-ranked (#3) Lenadores in the North group. He was the top scorer with 23 points. 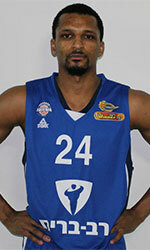 Akindele also added 6 rebounds in 28 minutes. Akindele has individually a very good year with high stats. He averages: 17.0ppg, 8.4rpg and 2.8apg in 42 games. Akindele is also Nigerian national team player. #5. International guard Michael Efevberha (193-84, agency: Octagon Europe, college: CS Northridge, currently plays in Lebanon) was the main contributor in Homentmen's victory against the league outsider Sagesse (1-13) 89-82 in a derby game in the Lebanese LBL on Thursday night. Efevberha was the best player in that game. He scored 23 points and added 3 assists in 32 minutes. Homentmen Beirut (11-4) is placed third in the LBL. Efevberha's team will play only one more game in the Regular Season. And that game will be critical. Efevberha has very impressive stats this year: 20.9ppg, 4.5rpg, 2.0apg and 1.6spg in 14 games. He has both American and Nigerian nationalities. Efevberha plays currently for the Nigerian national team. #6. Forward Abdullahi Kuso (206-84, college: Tallahassee CC, currently plays in Japan) was the major contributor in Gunma's victory against the second-ranked Toyotsu FE (32-17) 96-90 in the Japanese B2 League last Saturday. Kuso had a double-double by scoring 24 points and getting 17 rebounds. He also added 2 blocks in 41 minutes. It was the game of the round between two top 3 ranked teams in group East. Gunma Crane Thunders (35-14) are placed first. 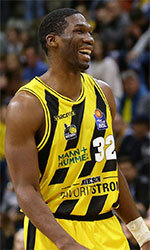 Kuso has very impressive stats this year: 16.0ppg, 10.8rpg, 3.2apg, 1.9bpg and 1.4spg in 48 games. He is a former international player as he played for the Nigerian senior team twelve years ago. #7. International swingman Stan Okoye (198-91, college: VMI, currently plays in Spain) was not able to help Zaragoza (11-12) in their last game on Sunday. Despite Okoye's very good performance Zaragoza was crushed 116-94 on the road by the one of league's weakest teams UCAM Murcia (#17). He was the top scorer with 22 points. Okoye has reliable stats this season: 14.1ppg and 4.7rpg. He also holds two passports: Nigerian and American. Okoye is also Nigerian national team player. #8. Power forward Suleiman Braimoh (203-89, college: Rice, currently plays in Israel) was not able to secure a victory for Hapoel Eilat (14-8) in their last game. Despite his very good performance Hapoel Eilat was edged 88-85 in Beer Sheva by the lower-ranked (#5) Beer Sheva. Braimoh was the second best scorer with 17 points in 29 minutes. They ended the series of three consecutive victories. Braimoh has very impressive stats this year: 16.6ppg, 5.3rpg, 1.8apg and 1.6spg in 18 games. He holds both American and Nigerian passports. Braimoh used to play for the Nigerian national team back in 2016. #9. International forward Al-Farouq Aminu (206-90, college: Wake Forest, currently plays in NBA) contributed to a Portland Trail Blazers' victory against the Indiana Pacers (44-29) 106-98 in the NBA on Monday night. Aminu scored 16 points in 26 minutes. The Portland Trail Blazers have a solid 44-27 record this season. Aminu is one of the most experienced players in a team as it's his fourth year in Trail Blazers' roster. His stats this season are: 9.2ppg, 7.5rpg and 1.3apg in 71 games. Aminu holds both American and Nigerian passports. Despite he played previously for the USA U19 national team, Aminu is currently in the Nigerian national team roster. #10. Guard Keith Omoerah (194-92, college: Manitoba, currently plays in Ukraine) helped Mykolaiv edge the closely-ranked Kyiv Basket (14-12) 74-72 in the Ukrainian Superleague in Thursday night's game. He was the top player that evening. Omoerah scored 20 points, grabbed 5 rebounds and made 3 blocks; not bad, considering it's only his second season in pro basketball. It was the game of the round between two top 4 ranked teams. MBC Mykolaiv (6-6) is placed third in the Superleague. Omoerah's team will play only one more game in the Regular Season. And now that game is very crucial. Omoerah averaged so far 13.4ppg, 5.9rpg, 2.7apg and 1.2spg. He is an international player who is currently on the senior Nigerian National Team roster. #11. Former international small forward Thanasis Antetokounmpo (199-92, currently plays in Euroleague) managed to help Panathinaikos Superfoods Athens to win against the second-ranked CSKA 78-77 in the Euroleague on Friday night. Antetokounmpo scored 5 points. Antetokounmpo's overall stats this season are: 4.8ppg and 1.8rpg. He used to play for the Nigerian national team three years ago. #12. International power forward Talib Zanna (206-90, college: Pittsburgh, currently plays in Israel) helped Ironi Nes-Ziona win their game against the league outsider Bnei Hasharon 81-62 in the Israeli Winner League last Sunday. Zanna was the top player that evening. He recorded 13 points and grabbed 7 rebounds. Zanna averaged so far 11.6ppg, 7.8rpg and 1.2spg. He is also in the roster of the Nigerian national team. #13. International power forward Alade Aminu (207-87, college: Georgia Tech, currently plays in Israel) couldn't help Hapoel Tel-Aviv (9-13) in their last game. Despite Aminu's good performance Hapoel Tel-Aviv lost 89-95 in Ashdod to the lower-ranked (#10) Maccabi. He recorded 11 points, 9 rebounds and 2 blocks in 24 minutes. This year Aminu's overall stats are: 9.7ppg, 6.8rpg and 1.1bpg in 21 games. He is also Nigerian national team player. #14. Former international point guard Josh-Emmanuel Akognon (180-86, college: CS Fullerton, currently plays in South Korea) helped Goyang Orions win their game against the closely-ranked KT Sonicboom 86-80 in the South Korean KBL on Tuesday night. Akognon scored 14 points in a mere 18 minutes. Akognon's stats this year are: 13.9ppg and 2.0apg in 14 games. He holds both American and Nigerian passports. Akognon used to play for the Nigerian national team back in 2016. #15. International forward Emmanuel Omogbo (203-95, college: Colorado St., currently plays in Israel) helped Ironi Kiryat Ata win their game against the 12th-ranked Maccabi Rehovot 91-88 in the Israeli National League (second division) on Tuesday night. He recorded a double-double by scoring 22 points and getting 10 rebounds. This season Omogbo has very high stats. He averages: 18.6ppg, 14.6rpg and 1.4apg. Omogbo holds both American and Nigerian passports. He is also in the roster of the Nigerian national team. #1. Giannis Antetokounmpo (211-G/F-94, agency: Octagon Europe, currently plays in NBA) could not help the Milwaukee Bucks (53-19) in their last game. Despite his very good performance the Milwaukee Bucks (53-19) lost 125-130 on the road to the Philadelphia 76ers. Antetokounmpo had a double-double by scoring 52 points and getting 16 rebounds. He also added 7 assists in 36 minutes. It's Antetokounmpo's sixth season with the team. Antetokounmpo has individually a very good year with high stats. He averages: 27.5ppg, 12.7rpg, 6.0apg, 1.4bpg and 1.3spg in 65 games he played so far. Antetokounmpo has a dual citizenship: Greek and Nigerian. #2. Micheal Eric (210-C-88, college: Temple, currently plays in Euroleague) led his Turkish team Darussafaka to a victory over the closely-ranked Khimki (9-19) 91-85 in the Euroleague last Wednesday. He was MVP of the game. Eric recorded a double-double by scoring 22 points and getting 15 rebounds. Darussafaka Istanbul (4-24) closes the standings in the Euroleague. There are only two games left until the end of the Euroleague Regular Season. So now every game will be critical. Eric has relatively good stats this season: 11.3ppg and 5.2rpg. #3. Michael Ojo (216-C-93, college: Florida St., currently plays in ABA League) was the major contributor in a Crvena Zvezda's victory against the fifth-ranked Mega Bemax (10-12) crushing them 100-76 in the ABA League on Saturday night. Ojo recorded 14 points and grabbed 9 rebounds in 21 minutes; quite an impressive performance considering it's only his second season in pro basketball. Crvena Zvezda MTS Beograd (21-1) is placed first in the ABA League. It was his team's fifth consecutive victory in a row. There are only two games left until the end of the ABA League Regular Season. So now every game is very crucial. It's Ojo's first year with the team. This season Ojo averages: 8.9ppg and 6.2rpg in 22 games. Worth to mention he played also at Eurobasket Summer League, which helped him get the job in pro basketball. #4. Ike Joseph Udanoh (203-PF-89, college: Wayne St., MI, currently plays in Italy) contributed to an easy victory against one of league's weakest teams Grissin Bon RE (5-17) crushing them 91-59 in the Italian Serie A last Sunday. He recorded 9 points, 8 rebounds and 6 assists. Sidigas Avellino (14-8) is placed fourth in the Serie A. Udanoh has reliable stats this season: 12.0ppg, 8.3rpg and 4.3apg. He is another player who holds two passports: Nigerian and American. #5. Josh Okogie (193-G-98, college: Georgia Tech, currently plays in NBA) was not able to help the Minnesota Timberwolves (32-40) in their last game on Sunday. Despite his very good performance the Minnesota Timberwolves (32-40) were defeated 117-102 in Houston by the Rockets. Okogie was the second best scorer with 21 points. He also added 5 rebounds and 3 assists. Okogie has reliable stats this season: 7.5ppg, 3.0rpg, 1.2apg and 1.1spg. He has both American and Nigerian nationalities. Despite Okogie's Nigerian passport, he previously played for the USA U19 national team and is probably not eligible to play for the Nigerian team. #6. Zaid Hearst (193-G-92, college: Quinnipiac, currently plays in Lithuania) was not able to secure a victory for Nevezis (4-21) in their last game on Sunday. Despite his very good performance the bottom-ranked Nevezis was edged 81-78 in Prienai by the higher-ranked Prienu Skycop (#7). Hearst was the top scorer with 28 points. He also added 7 rebounds. Hearst's stats this season are: 14.2ppg, 3.4rpg, 1.2apg and 1.2spg. He also holds two passports: Nigerian and American. #7. Peter Olisemeka (204-C-91, currently plays in Bulgaria) couldn't help Academik Plovdiv (8-10) in their last game. Despite Olisemeka's very good performance Academik Plovdiv lost 77-91 in Stara Zagora to the second-ranked Beroe. He had a double-double by scoring 17 points and getting 12 rebounds in 23 minutes. Olisemeka's stats this year are: 13.4ppg, 12.2rpg, 1.2bpg and 1.1spg in 18 games. He holds both Nigerian and Italian passports. #8. David Kadiri (200-F-95, college: Buffalo, currently plays in Serbia) contributed to a Sloboda Uzice's victory against the second-ranked Mladost ZE 92-86 in the Serbian KLS in Saturday night's game. Kadiri scored 17 points and grabbed 7 rebounds in 26 minutes. Kadiri's stats this year are: 10.3ppg and 5.0rpg in 26 games. He holds both American and Nigerian passports. #9. Experienced Kieron Achara (208-F-83, agency: Two Points, college: Duquesne, currently plays in United Kingdom) was the main contributor in a Glasgow Rocks' victory against the league outsider Worcester Wolves 92-79 in the British BBL on Sunday night. Achara was the top player that evening. He recorded 21 points, 6 rebounds and 2 blocks in 23 minutes. Achara's stats this year are: 12.0ppg, 5.7rpg, 1.7apg, 1.3bpg and 1.1spg in 21 games. He has Scottish and Nigerian nationalities. #10. Aleksey Adediran (201-C-82, college: Binghamton, currently plays in Ukraine) helped Mykolaiv edge the closely-ranked Kyiv Basket 74-72 in the Ukrainian Superleague in Thursday night's game. Adediran recorded a double-double by scoring 14 points and getting 12 rebounds. He also added 4 assists. Adediran averaged so far 10.9ppg, 7.0rpg and 1.1apg. He has dual citizenship: Nigerian and Russian.